This mini almond biscotti recipe is made with coconut oil and toasted chopped almonds. It’s the perfect treat with a cup of coffee. Serve this biscotti with my Chewy amaretti cookies at your next brunch. This recipe was originally posted April 24, 2015, we’ve tweaked it a bit since then. This post may contain affiliate links. Read my disclosure policy here. 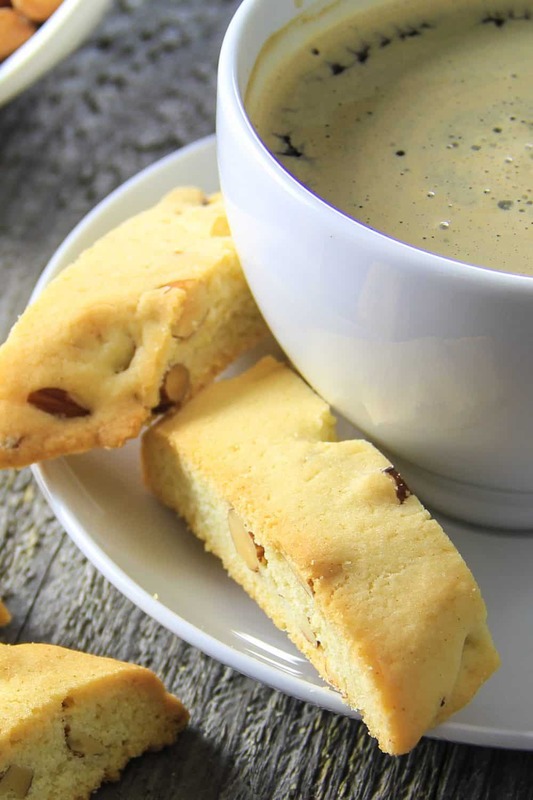 Biscotti are a great healthier alternative to most cookies, and they taste great too. They’re usually served with coffee or tea. They aren’t too sugary but sweet enough to enjoy with a cup of black coffee. 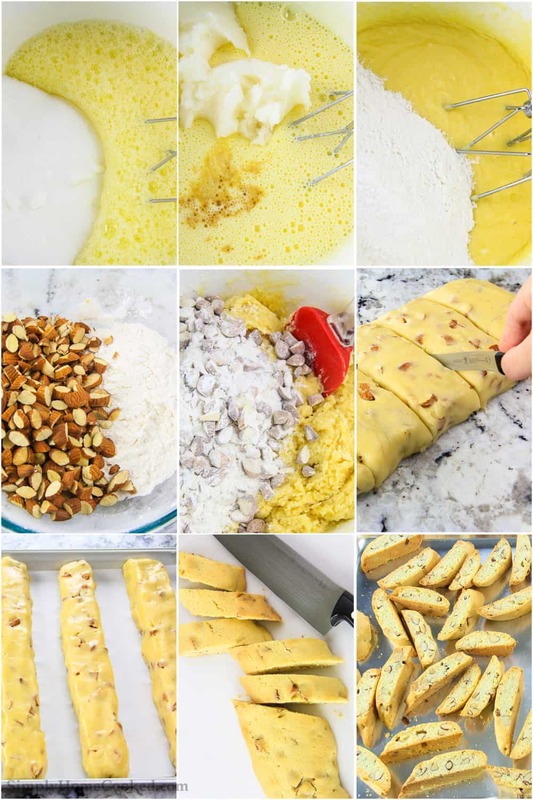 This almond biscotti recipe was created by my aunt Nelya. After countless trial and error batches, she gave this recipe a healthier twist and swapped the butter for coconut oil. Coconut oil compliments the toasted almonds to create a perfectly balanced indulgence. 1. Sift the flour, baking powder, and salt into a bowl. Reserve 1/2 cup of the flour mixture and set aside. 2. Coarsely chop the toasted almonds and combine them with the reserved 1/2 cup of flour. 3. In a separate bowl, blend the eggs with a handheld mixer just until foamy. Then blend in the sugar. 4. Add coconut oil, almond extract, and vanilla extract and mix just until combined. 5. Add the flour mixture to the eggs and mix using a spoon or spatula. 6. Then combine the floured almonds with the rest of the mixture. 7. Transfer the dough to a flat surface and shape it into a log. Then separate the dough into 5 equal parts. 8. Take each part and shape it into a long log making sure to press the sides evenly with your hands. You want the sides to be raised pretty high because they will spread quite a bit in the oven. 9. Transfer all 5 shaped logs onto the cookie sheet lined with parchment paper and bake in a 340 degree oven for 30 minutes. 10. Once it’s baked, cut each log into 3/4 to 1-inch slices. 11. Transfer the sliced biscotti back onto the cookie sheet and bake at 330 degrees for 10 minutes. (You don’t need parchment paper for the second round of baking). Let the mini biscotti cool down to room temperature before serving. Note: Make sure to use unrefined coconut oil. Refined coconut oil tends to have a higher fat content and it does not have any coconut flavor. First, let it cool completely before storing. You can do this by leaving them out on the counter for a few hours. After they are completely dried, store them in an airtight container like a tin or plastic bin. Separate layers of biscotti with parchment paper. How long does homemade biscotti stay fresh? If you store it properly, homemade biscotti will stay fresh for up to 3 weeks. 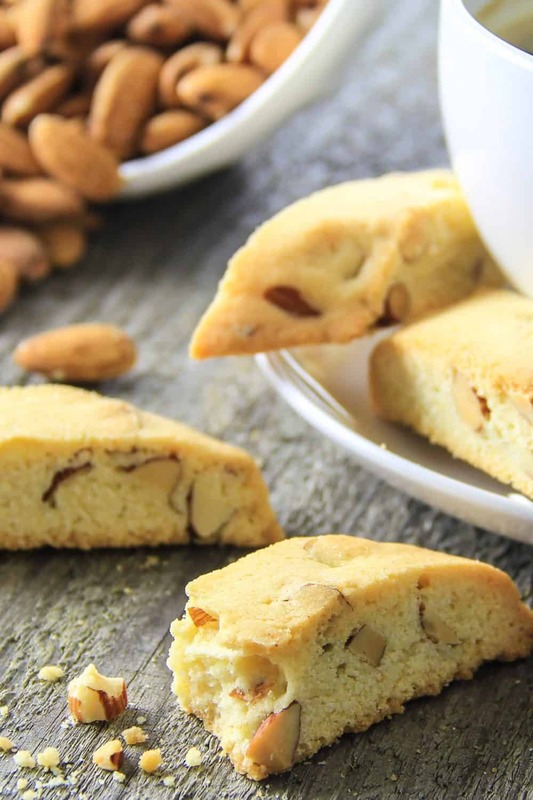 This mini almond biscotti recipe is made with coconut oil and toasted chopped almonds. It's the perfect treat with a cup of coffee. Sift the flour, baking powder, and salt into a bowl. Reserve 1/2 cup of the flour mixture and set aside. 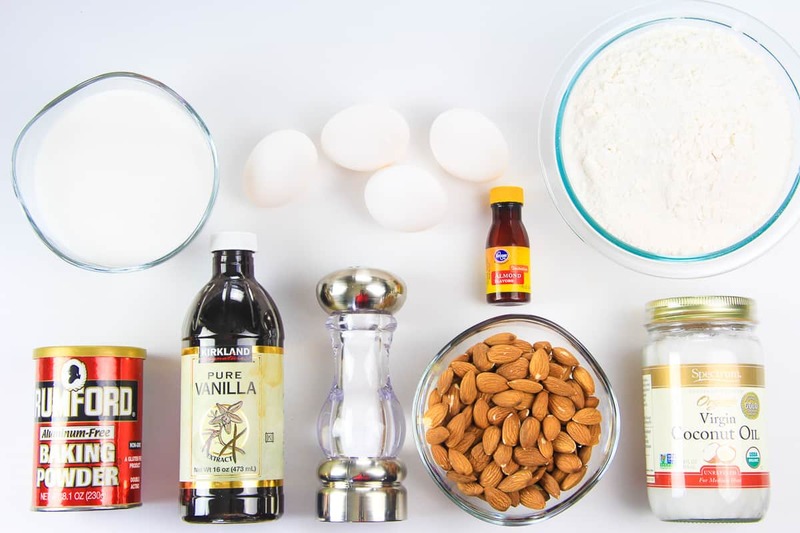 Coarsely chop the toasted almonds and combine them with the reserved 1/2 cup of flour. In a separate bowl, blend the eggs with a handheld mixer just until foamy. Then blend in the sugar. Add coconut oil, almond extract, and vanilla extract and mix just until combined. Add the flour mixture to the eggs and mix using a spoon or spatula. Then combine the floured almonds with the rest of the mixture. Transfer the dough to a flat surface and shape it into a log. Then separate the dough into 5 equal parts. Take each part and shape it into a long log making sure to press the sides evenly with your hands. You want the sides to be raised pretty high because they will spread quite a bit in the oven. Transfer all 5 shaped logs onto the cookie sheet lined with parchment paper and bake in a 340 degree oven for 30 minutes. Once it's baked, cut each log into 3/4 to 1 inch slices. Transfer the sliced biscotti back onto the cookie sheet and bake at 330 degrees for 10 minutes. (You don't need parchment paper for the second round of baking). Make sure to use unrefined coconut oil. Refined coconut oil tends to have a higher fat content and it does not have any coconut flavor. I made these for our library Holly Trail. Drizzled dark chocolate on tops of half & white on the other half & sprinkled with red & green sugar. Put two to a holiday cupcake wrapper, they looked amazing. Tasted great. Easy to do.